LOE1 is a smasher who mains Wario in Brawl and Project M, Luigi and Diddy Kong in Smash 4. He is currently ranked 13th on the Midwest Smash 4 Power Rankings and formerly 6th on the Michigan Smash 4 Power Rankings. 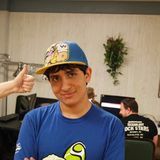 He has taken sets off of notable players such as Zinoto, Ally, Mr.E, Ryuga, Blacktwins and Rayquaza07. This page was last edited on February 13, 2019, at 19:21.